Nicol of Skene is an award winning civils contractor based in Aberdeen, Scotland. 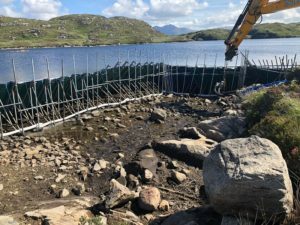 Part of a project for Scottish Water required a new 160mm intake pipe to be installed into Loch Inver and principal contractors, Amey, appointed Nicol of Skene to undertake the works. 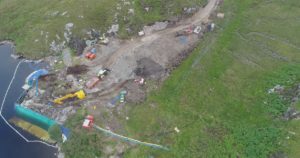 The requirement was for the pipe to extend 25m out into the loch and, like many lochs, the depth tends to drop off quite quickly, the loch depth being well over 3m at the 25m distance from the shore. A temporary dam system was required to create a dry working area to lay the pipeline and the hard and rocky bed meant that it was not possible to use steel piling or many temporary dam systems. OnSite were consulted to ascertain whether their Portadam system would offer a solution. The standard Portadam frames hold back up to 2.5m depth of water (extendable to 2.8m), but allowance had to made for any wave action on the loch. Initial thoughts were to manufacture and install larger frames but time constraints meant that the time to manufacture would be cutting into the schedule too much. 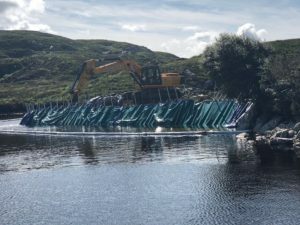 However with an element of good fortune an extended dry and hot spell meant that the levels in the Loch dropped quite markedly and following a survey, OnSite established that the 2.5m frames would, under these conditions ’almost’ reach the 25m target. The solution agreed upon was to install the Portadam as far out as possible and install all but the last section of pipe. The dam would then be removed and a dive team would install the remaining 6m section. OnSite undertook the dam works and as we regularly engage with specialist dive companies to help out with deep water Portadam installations, the Nicol team was happy for the installation of the final 6m pipe section to be completed using this specialist resource capability.